Highmaul: Who are we killing? Forever pushing this back, I decided to finally sit down in the twilight of Highmaul and write the article that a few have been poking me to write, or asking me things like: “So why are we killing this moss giant anyway?” Outside of purples and Abrogator Stones, there is a very good excuse for that, but we’ll get onto that later. 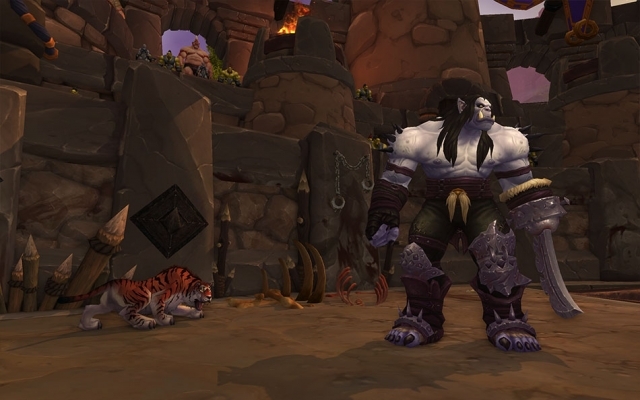 For now, let’s look at why we’re entering Highmaul in the first place! I always do love raiding cities when they’re well done. Blackrock Depths is a memorable first for many people to invade a city. With market quarters, entertainment districts and wealthy nobles walking around the raid instance, it really gives the place a lot of character and more depth that you can relate to as opposed to raiding a high fantasy fortress or something that doesn’t look like a place that is a home for its denizens. 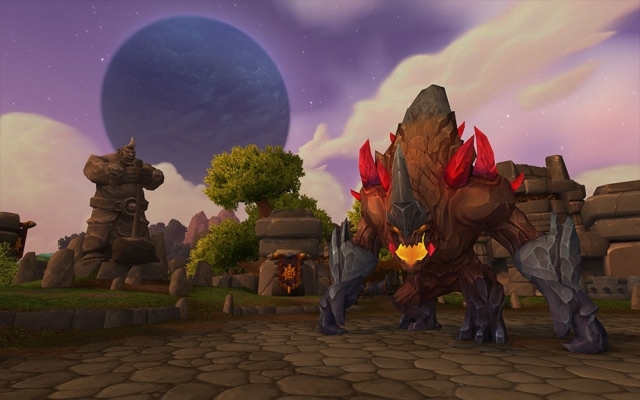 Highmaul is the capital city and seat of power for the Gorian Empire, the nation-state of ogres that ruled Draenor before the arrival of the Draenei. 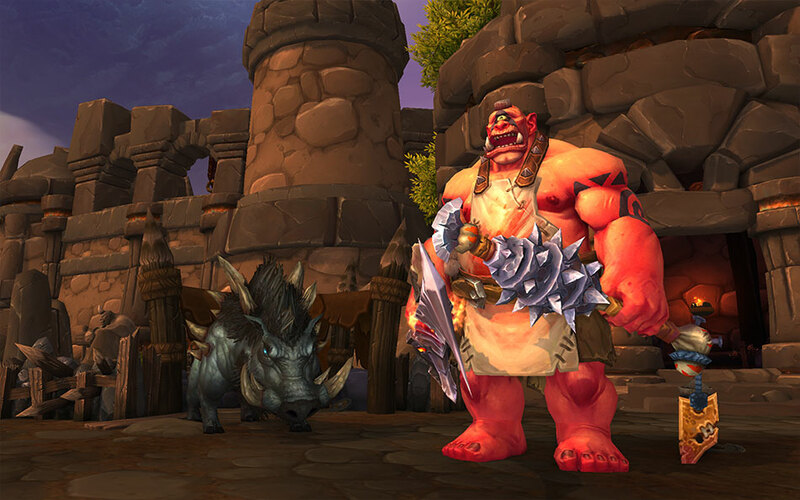 In this timeline’s Draenor, it was the combined might of the Iron Horde that pushed the Gorian Empire back to their home continent across the Barrier Sea, however their leader Imperator Mar’gok has struck up an alliance with Grommash Hellscream, and so Highmaul stands as the bastion-city of the ogres, and they have certain items of interest to us. Horde and Alliance invade Highmaul to bring Khadgar magical gems called Abrogator Stones and to gather the Felbreaker’s Tome and Sigil of the Sorcerer-King in order to aid in finding Gul’dan. Cho’gall also invades the city with the Pale to claim the ancient runestones for his own purposes. One of the first Warlords we encounter in Tanaan Jungle is Kargath Bladefist, where he makes us kill 100 gladiators for his amusement as a macabre mirror to his own imprisonment in Highmaul’s Coliseum. Other than appearances in Bladefist Hold in Spires of Arak and at Mok’gol Watchpost, we don’t really see much of Kargath until we first enter Highmaul and he’s standing with the crowd while we battle Vulgor. 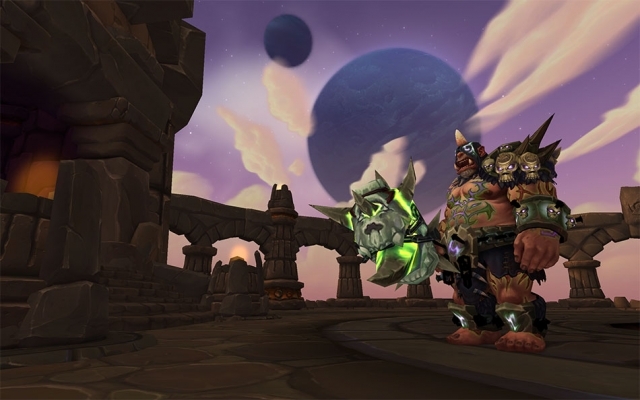 Once Vulgor is defeated, Kargath jumps into the arena claiming the crowd deserves a superior gladiator, and challenges the raid group to make him the first encounter of Highmaul. Whether he challenges us for his own pride, to get back at the amount of times we’ve escaped him from 90-100, or at the request of Mar’gok/Hellscream, we don’t know. Once defeated, he makes a reference to the arena in Tanaan Jungle, where killing him is the 100th orc slain for freedom in the arena. So he gets the honorable Orcish death, which is a nice way to see out one of the Warlords! Cho’gall also arrives to start his siege on the city, and for the rest of the raid the assault of the Pale is notable throughout. Hidden away in the underbelly of Highmaul, the Butcher was beaten and abused from his early days. That only served to strengthen his body and weaken his mind, right up to the point where he no longer remembers his own name. Most give him a wide berth as he hacks and slashes away at carcasses left in the pit. We have no real reason to kill him lore-wise, other than the fact that Khadgar claims it would be wise to defeat every last of the ogres within Highmaul, to ensure they don’t become a threat. He also drops Abrogator Stones, so he likely picked those up from a nobleogre that ventured too far into the ghetto of the ogre city. The Pale continue to invade Highmaul, and have managed to create a ritual to summon the primal earthen furies of Draenor, and attempt to bind it under their will to lay siege upon the citadel itself. However, like Wilfred Fizzlebang in Trial of the Crusader, they ended up with a trio of earth elementals Oro, Lokk and Rokkaa that decimate their summoners upon arrival. Once all three are defeated, the Living Mountain itself is angered and Tectus arrives. The raid group must then attempt to break Tectus down into shards, and again into motes before finally breaking him into dust before the Pale attempt to overwhelm the raid and break his mind. Essentially, the only reason we’re killing him is to stop Cho’gall from having an elemental superweapon that he can bend and enhance to his master’s will. An unfortunate death. With the Iron Horde juggernaut moored off the shores of Highmaul, Brackenspore became enraged. Driven by his primal instinct, he now wishes to eradicate any sign of civilization above the surface of the waters. If left unchecked, his fungal growth and moss quickly envelops the cliffs below Highmaul, and while the Iron Horde were barely holding him back, they ended up falling back to the safety of Highmaul, and it is up to the raid group to pick up the flamethrowers left behind and to combat the hostile fungus and encroaching moss to fight against the walker of the deep. As the only area of the city that Cho’gall’s presence isn’t made known, it could be speculated that Brackenspore’s ultimate master is the same as Cho’gall’s. Nevertheless, even with just his primal instict kicking in, it’s clear that once the moss begins to envelop the coast, it can quickly go out of control. 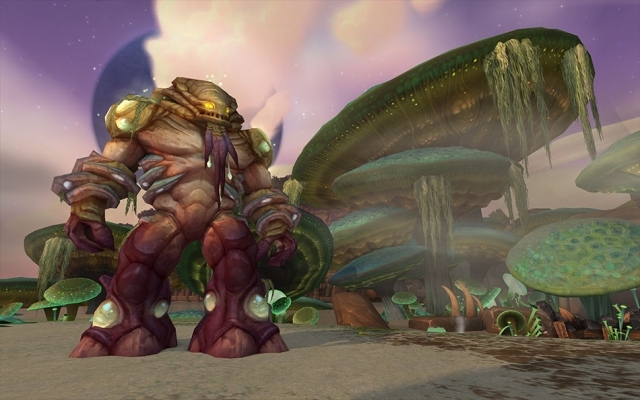 Defeating Brackenspore is an interesting sideline to the main story arc of the raid, and opens up opportunities as to what else could lurk within the Zangar Sea. Pol and Phemos are the two massive Ogron that serve as Imperator Mar’gok’s personal guard, stopping anyone unwelcome from entering the citadel’s main halls. What they lack in intelligence, they more than make up for in brute force, size and strength. They want to stop us from getting to Ko’ragh and Mar’gok, and will die for their master before letting us go through. Fortunately for them, the grand Imperator does aid slightly in placing an arcane barrier at the stairs to prevent us sneaking past the dim-witted Ogron, and in Mythic he also periodically enhances them in their combat against us – by causing Pol to replicate himself whenever he shield charges, or by making Phemos’s whirlwind also create a vacuum, dragging in enemies toward his flailing axes. Imperator also negatively enhances the raid by overloading them with arcane energy, causing them to explode with great force upon peak energy. Interestingly, one of the few single-headed ogres to have an exceptional grasp on magic, Ko’ragh gets his exceptional abilities initially by luck mainly. He was the only ogre to survive direct exposure to an unearthed runestone in an excavation in Nagrand, that granted him an interesting immunity to all forms of magic – fel included. Taking the runestone back to Highmaul for research, Ko’ragh begins to teach other ogres various methods of Breaker rituals. Ko’ragh holds the Felbreaker’s Tome, a key item in locating and defeating Gul’dan. The pages of the tome appear blank however, so we have to obtain the Sigil of the Sorcerer King from Imperator himself in order to aid Khadgar. Story-wise, nothing much changes in mythic, we just get to see more of his Breaker magic work in the form of mind control and fel magic usage. We’ve had a short break from the Pale with them not appearing in this encounter either, but we’re far from seeing the end of them as the trash between Ko’ragh and Mar’gok has an epic battle between the Pale and Ogre forces. The current leader of the Highmaul, Mar’gok descends from a line of sorcerers who have ruled the Gorian Empire. At a far cry from the ogres we know on Azeroth, the grand Imperator is both cunning as well as brutal, while having an excellent understanding of arcane magic that surpasses even Khadgar to some extents. Allying with the Iron Horde, there is a clear reason why he is a threat to the Horde and the Alliance without even holding onto the Sigil of the Sorcerer King that is required for Khadgar to use the Felbreaker Tome acquired from Ko’ragh previously. In mythic, Cho’gall arrives when Mar’gok gets low health and ensnares him in a field of dark magic before absorbing the power of the runestones through Mar’gok, ultimately killing him. Although not a boss encounter in himself as more the final phase of the Imperator fight in mythic, this guy still deserves his own subsection. Why? It’s obvious why we want to kill him, he’s gone mad already and wants to kill us! Purely in defense of our own hides, we also find out some interesting tidbits from him that I’m looking forward to Blizzard expanding upon. Firstly, alternate Cho’gall appears to have the same world-ending agenda as the Cho’gall in our universe did, he just has less eyes and looks more like an ogre here. He betrays not only Mar’gok, but in Nagrand he also betrays Gul’dan when he absorbs the void powers of K’ure. With the void powers, he is able to subjugate the Pale to assault Highmaul and gain the powers of the Sorcerer King’s runestones. 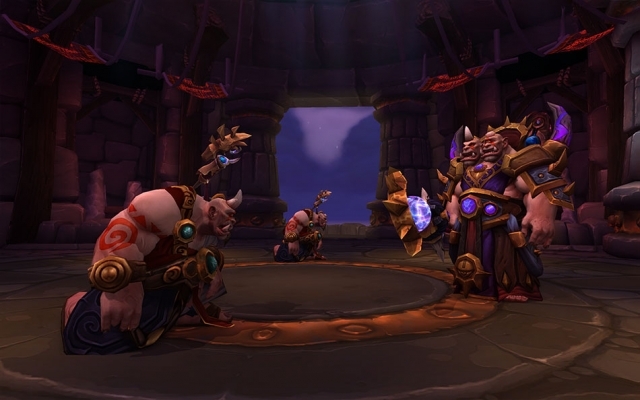 However, assuming you don’t fail the raid team defeats Cho’gall, but not before he leaves an ominous and cryptic warning that his new master is drawing close to Draenor. 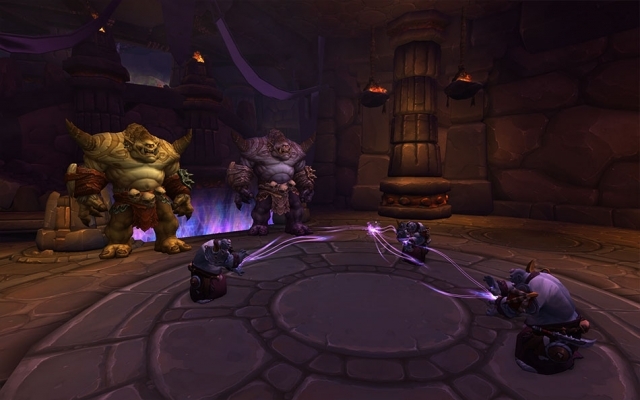 Between the Pale speaking a language very similar to the Old Gods of Azeroth, and the questline on old Outland involving the C’thun lookalike, it will be interesting to see who Cho’gall’s master is – the Burning Legion (but wanting to outrank Gul’dan), Dimensius or some other void god, or explore whether or not Draenor has its own set of Old Gods waiting to burst out of their ancient prisons. The Arakkoa certainly seem like they could be descendants of titanic watchers, no?